With only two females left and the last male now gone, the only chance left for survival of the species is artificial reproduction using “genetic material” collected from the male. 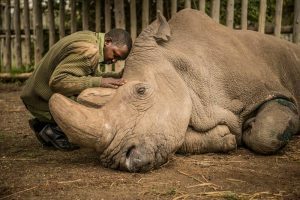 Sudan, the last male of his species, died in Kenya on March 19. He was 45, which is very old in rhino years. Sudan was captured in the wild when he was 2, and sent to live most of his life at a zoo in the Czech Republic. He spent the last years his life at the Ol Pejeta Conservancy in Kenya with two northern white rhino females. “The thinking was that in a place closely resembling their homeland, they would thrive. Northern white rhinos used to be found in an area spanning Uganda, Chad, southwestern Sudan, the Central African Republic and the Democratic Republic of the Congo,” writes Eyder Peralta for NPR.